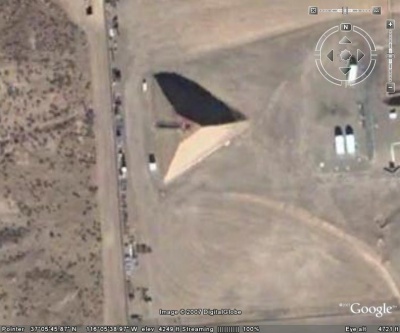 The Area 51 pyramid? Image Source: Google Earth via Digital Globe via Pakalert Press. Area 51 - the secure Nevada military base that is the darling of nuclear activists, conspiracy theorists and UFOlogists - has lately been the site of a big new construction project. 51-watchers are captivated by a pyramid evident in satellite shots of Area 51's nuclear testing grounds (see video here). Wild discussions about the pyramid suggest that the US military is employing ancient and alien technology. The military does little to dissuade them. Who could forget this curiosity from Missouri in December 2011? The Lockheed SR-71 'Blackbird,' developed in the early 1960s, is the predecessor of the anticipated new spy plane. 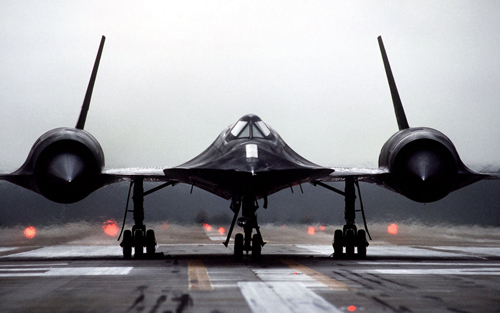 The original flight manual for the Blackbird was 1,052 pages long. Image Source: Industrial Equipment News. Something big is in the works at Nevada's legendary Area 51 military base. A massive new building is under construction at the top secret location. Aviation experts say there's a good chance that a new, highly classified aircraft might soon be zipping around the Nevada skies. What kind of aircraft? One possibility is a successor to the SR-71 spy plane, the SR-72. The SR-71 Blackbird is widely regarded as the greatest airplane ever built. It sliced through the sky at Mach 3 and still reigns, officially anyway, as the fastest plane in history. Groom Lake, also known as Area 51, was home for the Blackbird during its early days. The question is -- will Area 51 also be the location of choice for the development of a successor, and maybe more than one? A photo of a new building under construction at Area 51 has raised tantalizing possibilities for the civilian researchers who dabble in such topics. No one can say for certain what the building will be used for, but aviation historian Peter Merlin says the one thing we can say is that it's one big hangar. "It probably measures 275 feet by 600 feet. It's no larger than hangars at other bases, but it certainly is the largest at Area 51," Peter Merlin said. Satellite photos confirm Area 51 already has two dozen hangars, including some less than two years old. So what's going on out there? [Peter] Merlin thinks there are other possibilities also in the works at Groom Lake. "There are at least seven and maybe as many as eleven manned classified air craft that have not yet been unveiled that have been flying since 1985 and countless unmanned programs as well. Most of these things have been tested there. I know some of the guys that have flown these airplanes," Merlin continued. Among the suspects is something called the Black Manta, a stealthy hypersonic craft that might explain the wispy images captured in a few photos around the world. Various black triangle-type craft have been spotted over American military bases and cities for years, some of them huge in size, big enough to require a big hangar. Aviation journalist Bill Sweetman has long argued for the existence of the Aurora, another plane rumored to have been flown at Groom Lake. Sweetman says black budget figures hint at the existence of the plane, which some have dubbed the SR-75 penetrator. Whichever of these ambitious projects ends up in full development, it's abundantly clear that the testing location of choice for top secret planes is still Area 51. See my previous post on Area 51. IT IS TERRIBLE BUT THE CABAL ARE THE LOOSERS NOW! Here is a comparison between SR-72 and SR-71 which is a successor from Lockheed.